Welcome to the eleventh lesson of the Creative Prayer Book. In this lesson, I work again with text, but this time, it’s all about embellishing the words that are already in the book. Though I’ve discussed embellishing text a little bit in a few of the recent lessons, today is about using a few simple techniques to make the words stand out using marker and pen. Besides coloring in the text with solid color, outlining is probably one of the most basic embellishing techniques. It’s easy enough to use a contrasting color, whether it’s white or black, to go around the edge of words and letters and create a bit of a “pop”. The outline creates a nice separation with the background, and the contrast really heightens the effect. Sometimes creating a dark rectangle or box around a word can make it pop as well. I started off with Posca paint markers on the spread below to create the red letters, and then I used my black uni-ball Vision pen to create the rectangle. Unfortunately, this technique didn’t work out too great at first, and I had to add several layers of red to cover up the ink letters below. Sometimes things don’t go according to plan, but things can usually be salvaged. This is like a combination of the above techniques — outlining and boxing it in. By leaving a bit of a space between the letter and the outline, I can tie whole words together in a single outline, as I create a slightly different effect. I do try to make the outline rather thick and heavy so that it stands out. 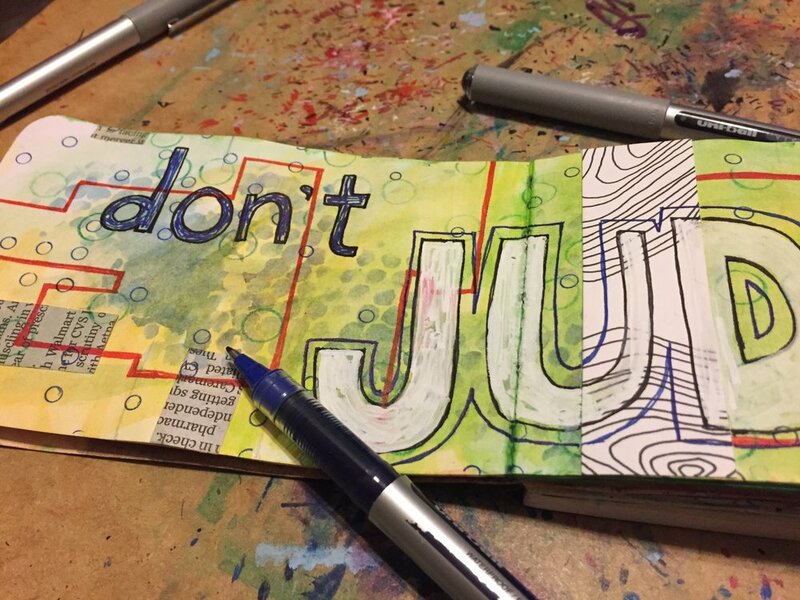 Try to experiment with embellishing text in a variety of ways in order to make it stand out. Use any materials that you want, and try some of these techniques or come up with your own. Just think of ways to jazz up your words and writing. Thanks for joining me once again, and happy creating!